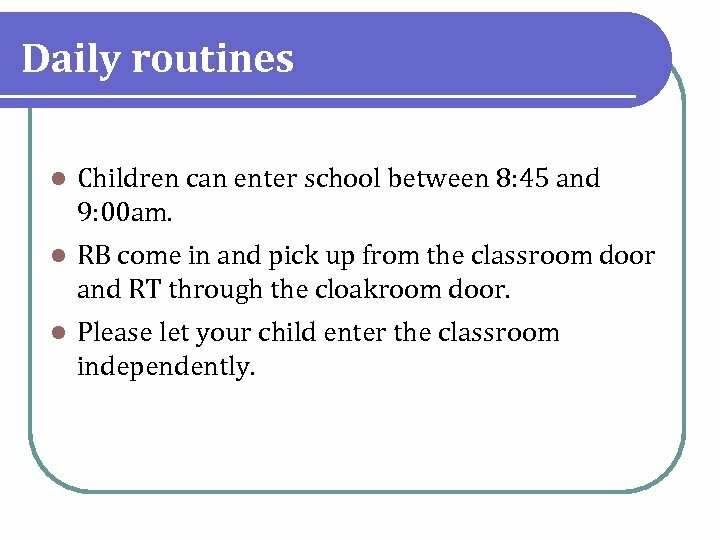 Daily routines l Children can enter school between 8: 45 and 9: 00 am. 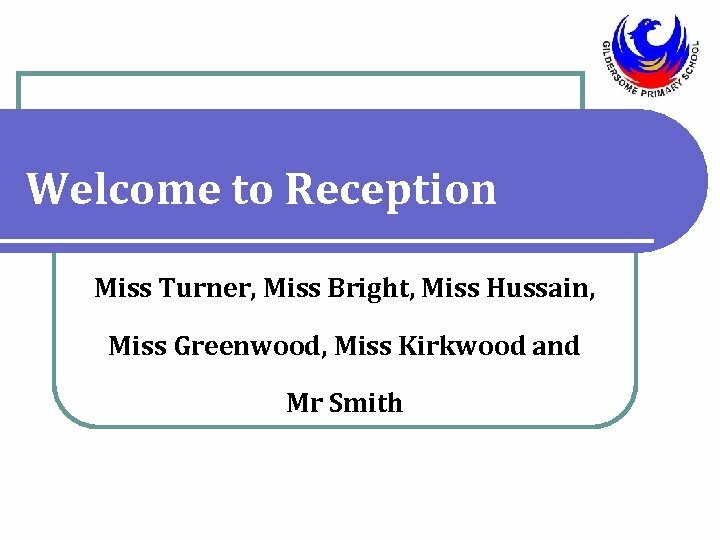 l RB come in and pick up from the classroom door and RT through the cloakroom door. l Please let your child enter the classroom independently. 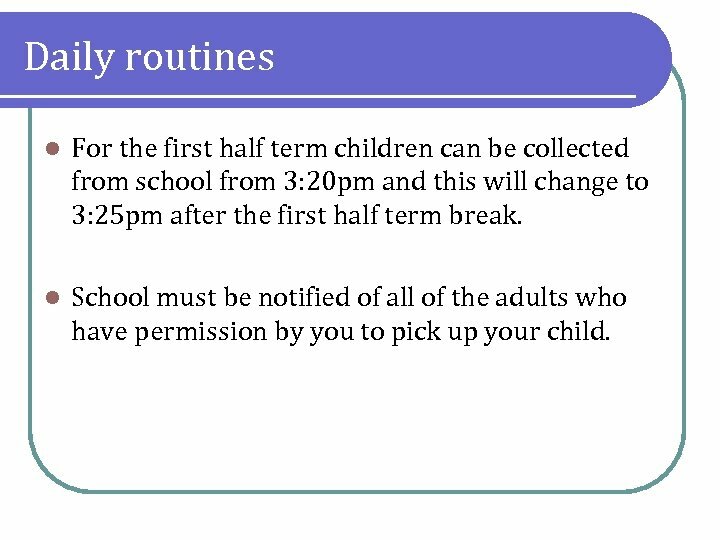 Daily routines l For the first half term children can be collected from school from 3: 20 pm and this will change to 3: 25 pm after the first half term break. 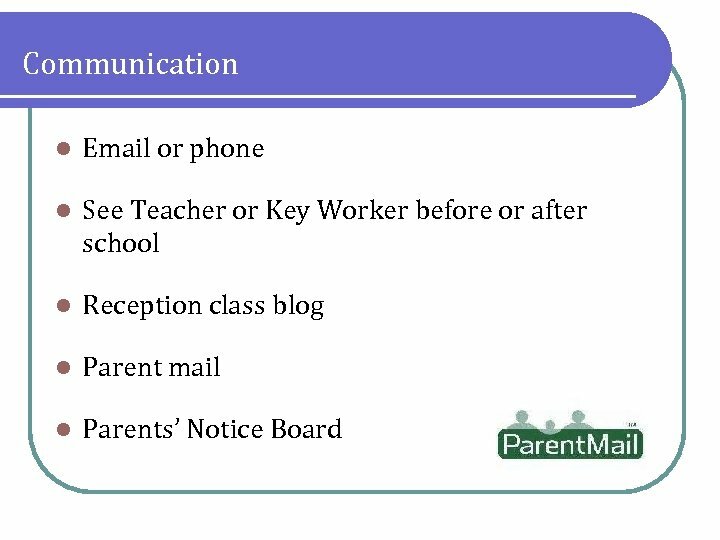 l School must be notified of all of the adults who have permission by you to pick up your child. 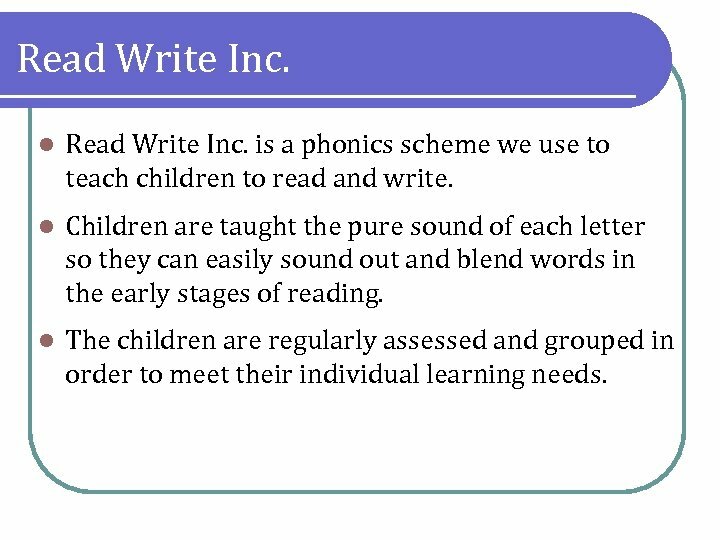 Read Write Inc. l Read Write Inc. is a phonics scheme we use to teach children to read and write. l Children are taught the pure sound of each letter so they can easily sound out and blend words in the early stages of reading. 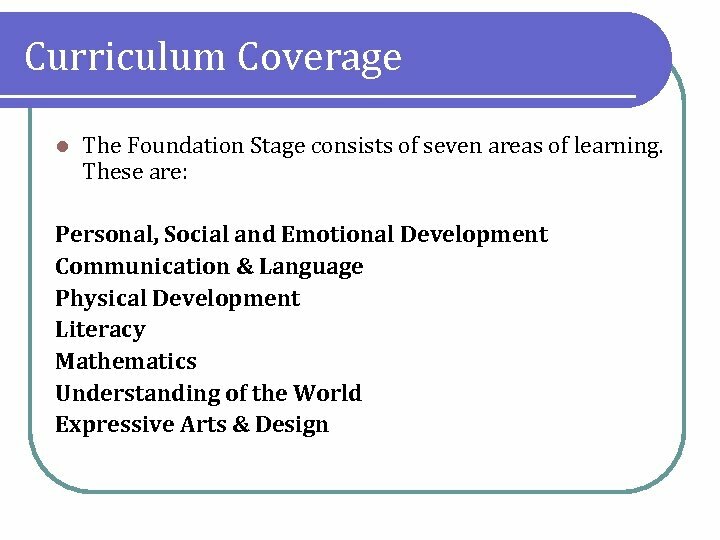 l The children are regularly assessed and grouped in order to meet their individual learning needs. 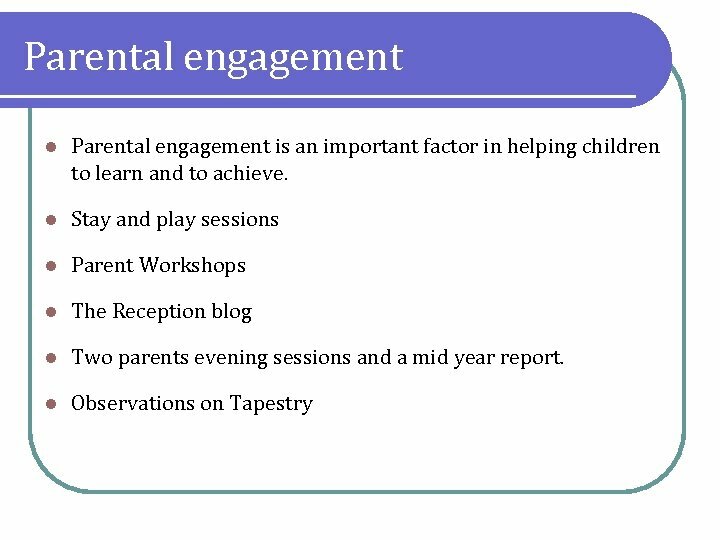 l Online learning journey l Trialled last year and had positive feedback from everyone l As parents, you will be able to view your child’s learning journey and add your own observations using the free app or the internet. 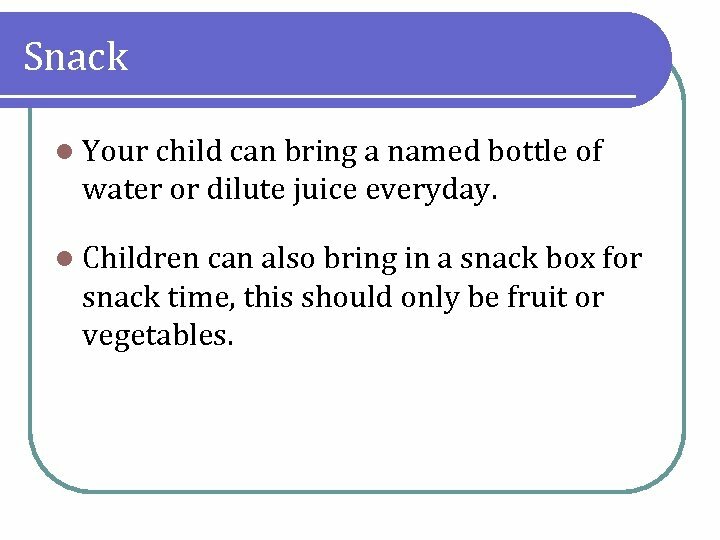 Snack l Your child can bring a named bottle of water or dilute juice everyday. l Children can also bring in a snack box for snack time, this should only be fruit or vegetables. Baking l Your child will have the opportunity to bake in school at least once a half term. l We will send letters home if containers are required. 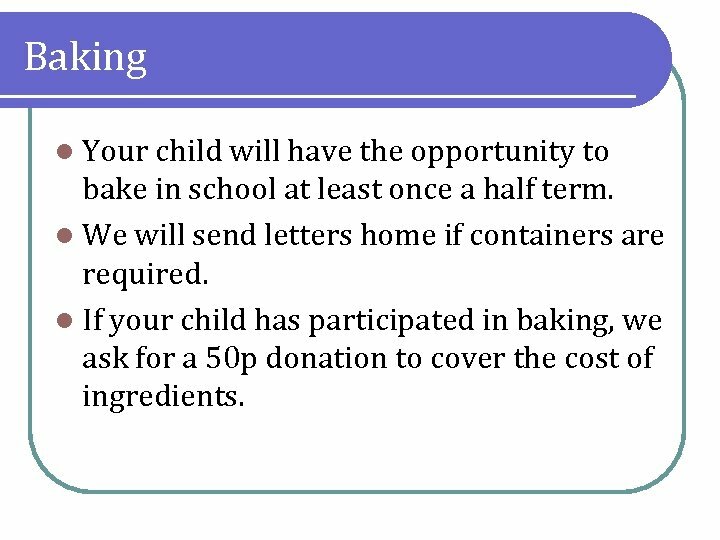 l If your child has participated in baking, we ask for a 50 p donation to cover the cost of ingredients. 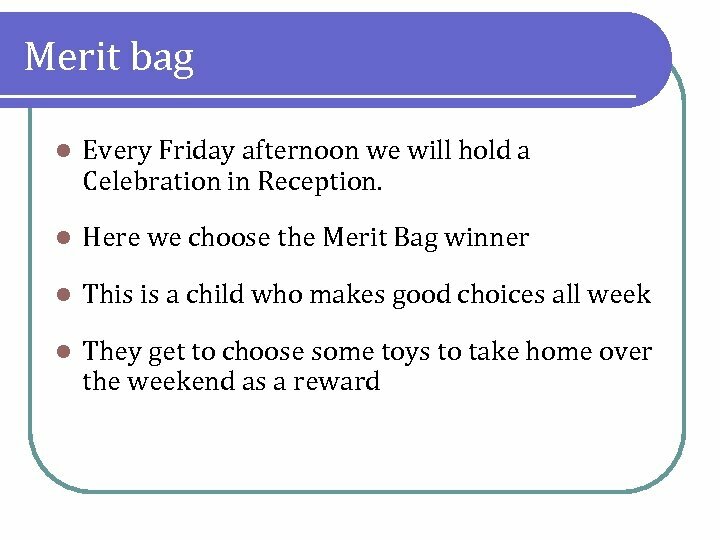 Positive behaviour management l The children have been assigned into a house, they will then collect house point for good behaviour choices and team work. l Children’s work is praised and shown to the rest of the class. Each classroom has a ‘Wow Wall’ where work is displayed with pride. l Exceptional pieces of work are taken to the deputy or head teacher who will issue them with a special sticker and certificate. 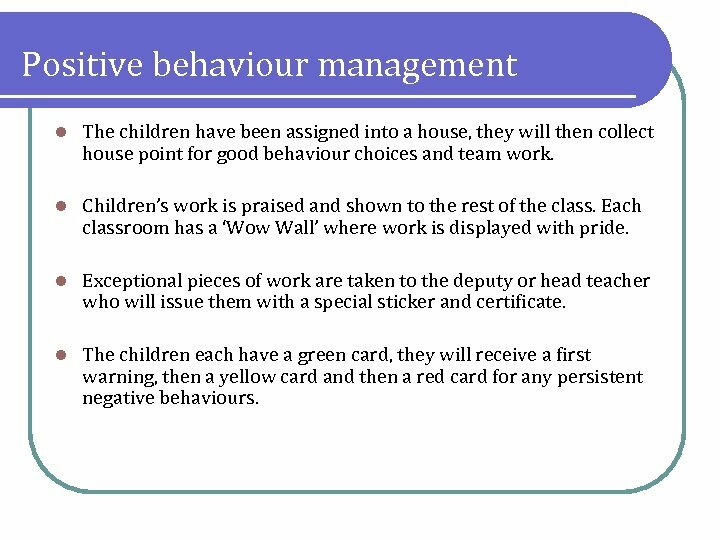 l The children each have a green card, they will receive a first warning, then a yellow card and then a red card for any persistent negative behaviours. School uniform l Anything your child brings to school must have a name on it! 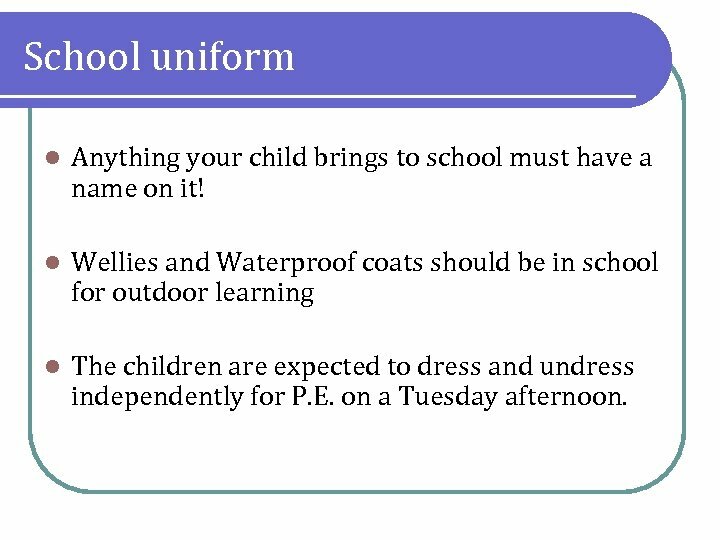 l Wellies and Waterproof coats should be in school for outdoor learning l The children are expected to dress and undress independently for P. E. on a Tuesday afternoon. 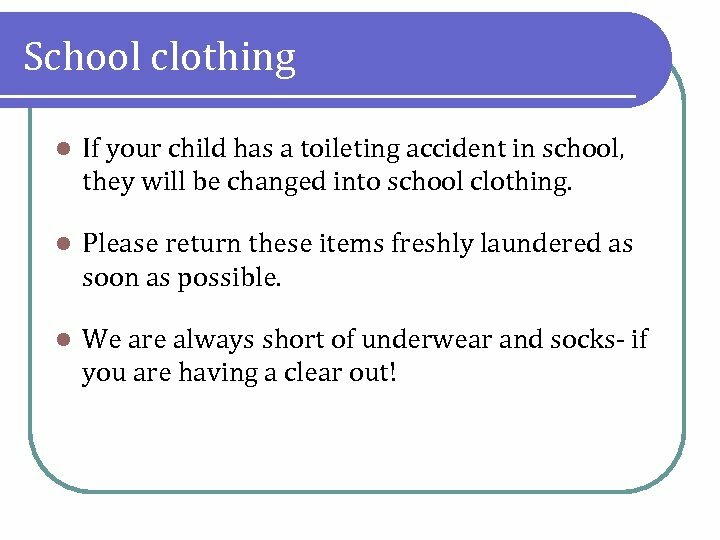 School clothing l If your child has a toileting accident in school, they will be changed into school clothing. l Please return these items freshly laundered as soon as possible. l We are always short of underwear and socks- if you are having a clear out! How can I support my child? 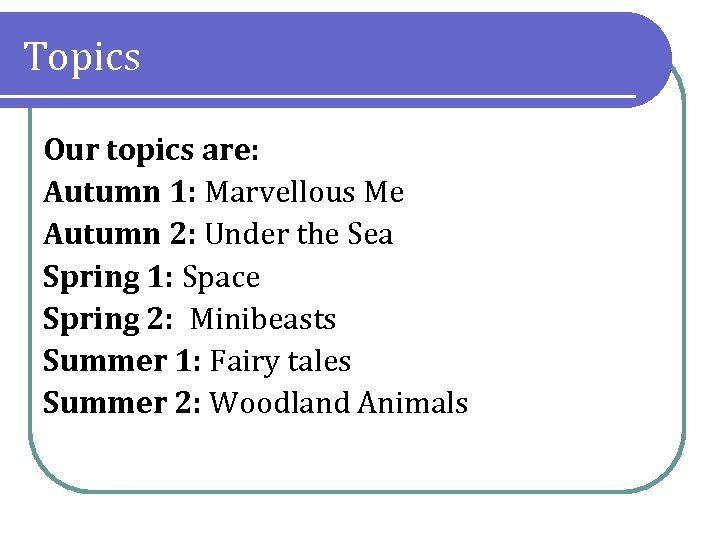 l Look out for updates on the class blog of what we have been doing in school and how you can extend this further at home. 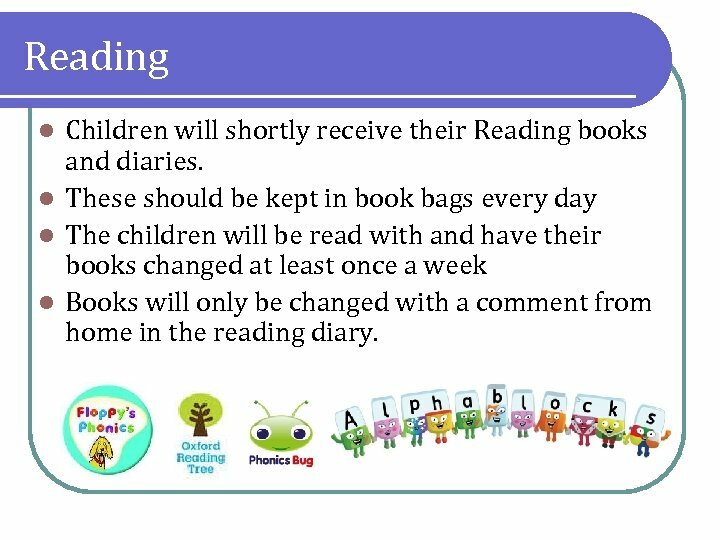 l Listen to your child read at home. 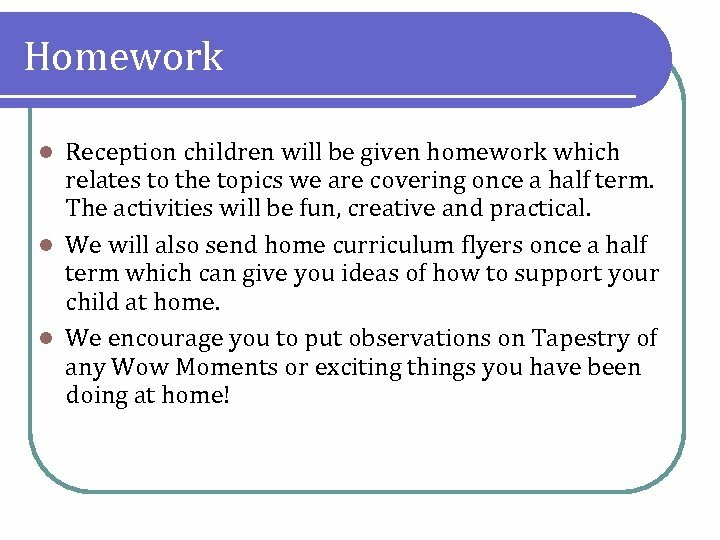 l Support your child with their homework. l Encourage them to write for a purpose – inside greeting cards, party guest lists etc. l Use and apply mathematics at home , counting up and down the stairs, reading the numbers on buses, sharing out objects equally etc.